All photos used, with permission, from Nebraska Gov. Pete Ricketts’ Facebook page. The Nebraska Department of Agriculture has put together a list of disaster relief resources for Nebraska farmers and ranchers seeking assistance due to severe weather, including NDA’s Hay and Forage Hotline and programs from the Farm Service Agency. *For farmers and ranchers experiencing tough times, they’re encouraged to reach out: https://lancaster.unl.edu/ag/OnlineRuralResourceList.pdf. *National Suicide Prevention Lifeline: A national network of local crisis centers that provides free and confidential emotional support to people in suicidal crisis or emotional distress 24 hours a day, 7 days a week: (800) 273-8255. *Crisis Text Line: Free, 24/7 support for those in crisis, connecting people in crisis to trained Crisis Counselors: Text GO to 741741. *Veterans Crisis Line: Connect with this resource to reach caring, qualified responders within the Department of Veterans Affairs. Many of them are Veterans themselves: (800) 273-8255, press 1, or Text to 838255. *For veterans affected by recent flooding in Nebraska, the Nebraska Veterans Aid may be able to assist with food, clothing,and emergency housing (i.e. hotel accommodations) go to https://veterans.nebraska.gov/nva. Veterans apply for NVA through their County Veteran Service Officer. For Flooding Resources, go to https://flood.unl.edu/. *Livestock producers now in need of hay, feed stuffs, fencing materials, volunteer help, equipment,etc. should call the Nebraska Department of Agriculture at (800) 831-0550. *Helpful information for farmers and ranchers (including the Livestock Indemnity Program; requiring 30-days response: https://www.fsa.usda.gov/state-offices/Nebraska/news-releases/2019/stnr_ne_20190318_rel_05?utm_medium=email&utm_source=govdelivery. *For those needing food, shelter, clothing and personal goods, call 211. *Nebraska Emergency Management — to ask questions: http://www.nema.nebraska.gov or call NEMA at: (402) 817-1551. *Residents who need help with home cleanup, cutting trees, removing drywall, insulation, flooring, furniture and appliances or other physical labor-type jobs, can call the Crisis Clean Up Hotline: (402) 556-2476 to get on a needs list. *American Red Cross: http://www.Redcross.org — you can donate time, money, blood donations. *When water has receded, still a lot of homes have been damaged, and if you want to volunteer: contact the Salvation Army Volunteer Hotline: (402) 898-6050. *Finally, for a list of storm spotter talks in Nebraska: https://www.weather.gov/oax/spotter. 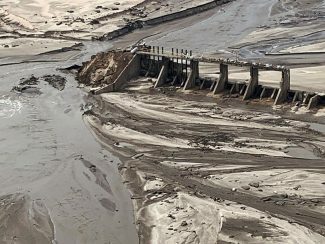 With some floodwaters receding in the aftermath of horrific, record flooding that engulfed several regions of Nebraska, the tumultuous toll from rapid, heavy snowmelt and heavy recent rainfall is blamed for three deaths, evacuation of homes, a devastating $400-million dollar toll on livestock, bridges pulled apart, roads washed out, a flooded church condemned, some sewage back-ups and more. Particularly hard-hit are east-central and southeast Nebraska, central Nebraska, and north-central Nebraska was also impacted. 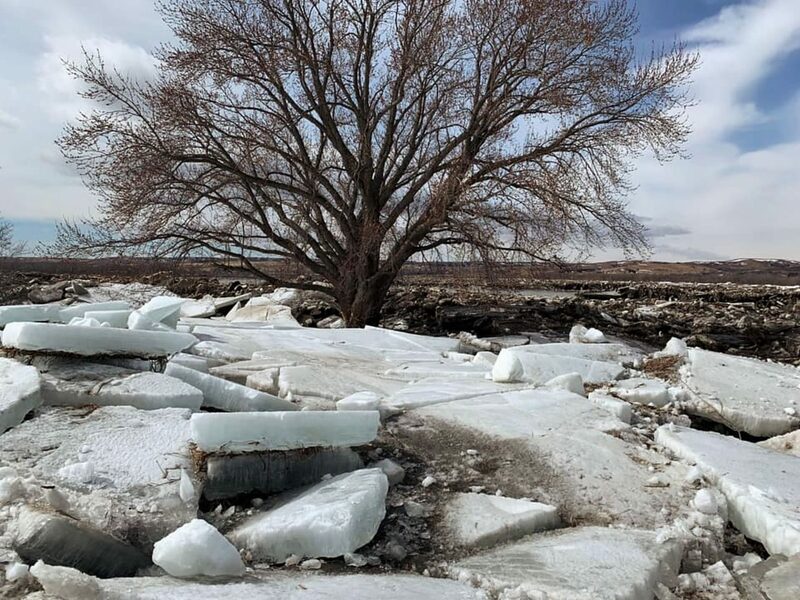 Unfortunately, rising spring temperatures will increase melting of snow and ice, resulting in more flooding at least through Friday, March 22 and possibly beyond. Flooding along the Missouri River (east central Nebraska) was expected all week. Vice President Mike Pence was meeting with Gov. 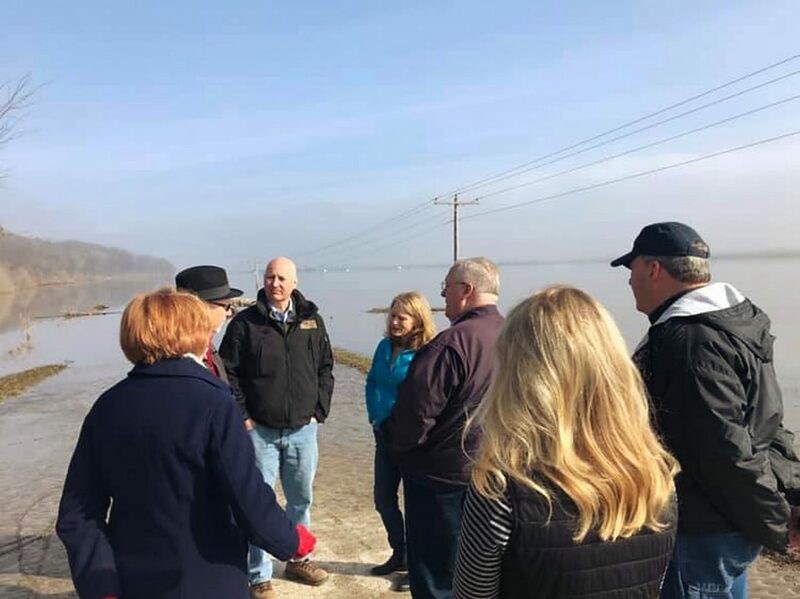 Pete Ricketts and tour flood-ravaged areas of Nebraska on Tuesday, March 19. There are difficult stories to share, and now also some positive ones which Gov. Ricketts relayed Monday evening, March 18, during a live conference call with directors of five key Nebraska state agencies providing vital updates. Tragically, officials have confirmed three people died in the flooding; and a fourth person is missing, with possibly another person missing. In Norfolk, Neb., a man died after driving his car into floodwaters. When a farmer near Columbus attempted to rescue a neighbor, his tractor went into a hole and flipped killing him. Authorities said his cousin rescued the person on top of a vehicle. Rescue officials were unable to get to an 80-year-old Columbus woman because of flooding, and she died. On the conference call, Gov. Ricketts shared a rescue story with a positive ending. "I was just in Wood River this afternoon with the mayor and fire chief. There's a great story from the Nebraska State Patrol providing a high water vehicle to a woman having a heart attack. "If it hadn't been for the Nebraska State Patrol, that woman probably wouldn't have made it." Gov. Ricketts said it's the spirit of Nebraska that's helping make a difference in the areas devastated by jaw-dropping flooding. "We'll get through it like we always do, people here have said," he said. To date, 163 people have been rescued by Nebraska State Patrol. Another 111 people were rescued by the National Guard, and 16 saved by Urban Search and Rescue. Joining the governor on Monday's conference call, were Nebraska National Guard Adjutant General Daryl Bohac, Nebraska Emergency Management Agency Assistant Director Bryan Tuma, Nebraska Department of Transportation Director Kyle Schneweis, Nebraska State Patrol Colonel John Bolduc, and Nebraska Department of Agriculture Director Steve Wellman. The flooding impact on agriculture is staggering. "On the livestock sector, the death loss from flooding and the blizzard, and sick animals needing care, and rebuilding damage has reached $400-million dollars of impact directly to the livestock sector, mostly to the beef sector," Wellman said. Concerning the number of farm acres now unusable from flood damage, "We haven't tried to accumulate that, at this point. We've tried to assess damage. However, for spring planting and field preparation, obviously there will be delays there, but its hard to know now, what that amounts to," he said. The Department of Agriculture has started a hotline at (800) 831-0550. "Our goal with that hotline is to receive calls from farmers and ranchers regarding what they need to continue with their operations, and to receive offers of supplies and help. Today, two-thirds of the calls we received offered supplies and help. We're very thankful for the response for those offering help to our farmers and ranchers," Wellman said. "This all has an impact when dealing with this daily, either on homes or farms and ranches, and so for anyone experiencing stress and needing to reach out, call: (800) 464-0258. President Trump signed a disaster declaration for Nebraska, including ine counties: Butler, Cass, Colfax, Dodge, Douglas, Nemaha, Sarpy, Saunders and Washington. In addition, 65 counties and five tribal nations were approved for public assistance. Counties that were not initially aproved could still be declared. "We're working as quickly as possible to get into the recovery process. As flood waters go down, check for damage in your home, and be safe before you go in," Gov. Ricketts said. He recommended removing carpet immediately, and anything that can hold water, since mold can set in within 24-hours. "Tell your local officials about the damage. Keep track of any damage you have, and take photos of any water in your house as we get into the personal assistance phase." Consistently emphasizing safety, Gov. Ricketts and other state officials advised Nebraskans against driving around barricades. "We've had to have people rescued who drove around barricades. We need the public to do their part, by respecting roads," he said. Flood waters have a lot of pollutants that are hard to see. 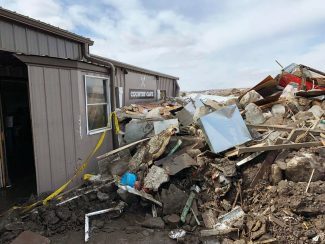 "We've had reports of fuel tanks and propane tanks in the flood waters that are showing up, so we're arranging for collecting that type of debris," said Gov. Ricketts, noting that local officials would be coordinating any health alerts. Also-flood waters are very cold, and hypothermia is a real concern. "And, a number of sewer systems have been compromised into the floodwaters, and we've had instances of children playing in floodwaters; which is a formula for disaster." Colonel John Bolduc of the Nebraska State Patrol said. "Turn around, don`t drown" is the life-saving caution from the National Weather Service when encountering flooded roads. Also, "Stay away or be swept away." Most flood deaths occur in vehicles. River banks and culverts can become unstable and unsafe. Excessive runoff from heavy rainfall will cause flooding of small creeks and streams, country roads, farmland and other low-lying spots. As the threat to human lives begins to subside, the Nebraska Department of Agriculture is now concentrating efforts to assist Nebraska ranch families and their livestock. Officials are speeding up the process for getting a federal major disaster declaration. "We're beginning to get calls for recovery issues, in the declaration process. We're expediting our request for federal disaster aid, and they're reviewing it now at the (Federal Emergency Management Agency) regional office. We'll put finishing touches on it to get a federal major disaster declaration," said Bryan Tuma, Nebraska Emergency Management Agency assistant director. Tuma said they'll also request public assistance for infrastructure. "We'll open a number of programs." 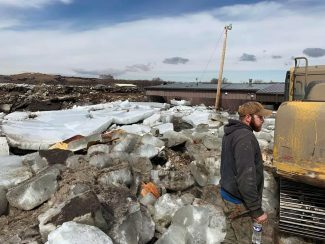 "Twenty-nine counties had mandatory evacuations, 18 counties let people return, six counties are not letting people back due to hazards," Tuma said. He's also trying to replace tired local responders. "We're trying to figure out how to switch them out." After being isolated with raging floodwaters, the city of Fremont, Neb., got a small break. 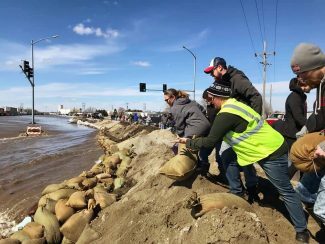 "We had a convoy that went in with eight trucks to bring much-needed supplies into Freemont Sunday night — great team effort by the Red Cross and Salvation Army," said Kyle Schneweis, Nebraska Department of Transportation director. However, there's considerable damage to infrastructure including roads and bridges. "Seventy-nine highways were closed at the peak of flooding, over 1,500 miles of highways but today that's down to 540 miles closed," Schneweis said. He said there are 200 miles of pavement that will require significant investment. "We now expect damage in the hundreds of millions of dollars for transportation." "We're still fighting the flood and have communities inundated with water. This flood fight will continue especially for people who live along the Missouri River. Downstream from Omaha is still in moderate flood, and then it's in record flood territory. The river is just now cresting and will probably be in record flood for the entire week (through March 23)," said Van DeWald, lead meteorologist with the NWS Omaha office, which also flooded when the dike failed Friday morning. 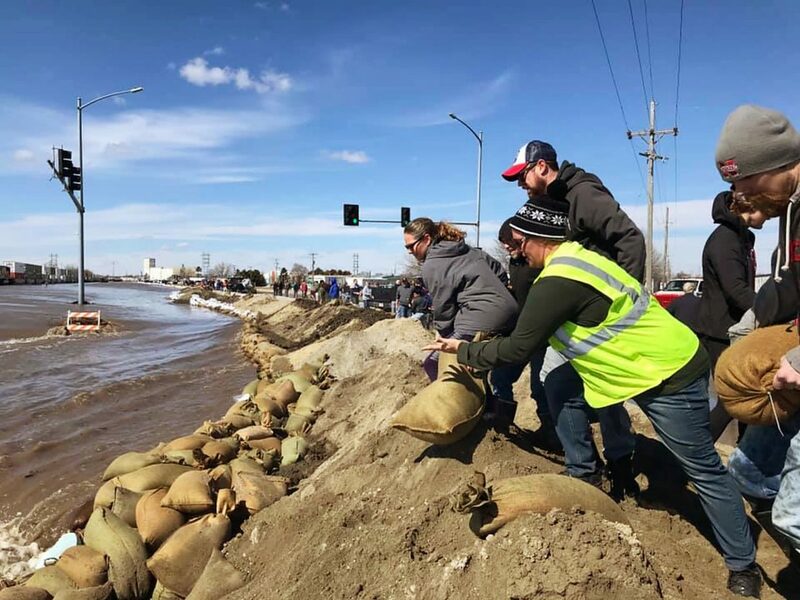 "Our (National Weather Service) office is a couple of miles from the Platte River, and our office had an hour to shutdown everything, move equipment up on desks and get out of the building," DeWald said. Some of the forecasters are working out of the Hastings NWS office, issuing all the alerts and forecasts. DeWald said the smaller rivers have come down, but it's the larger rivers that are experiencing flooding now. "Thousands of people evacuated, but midwesterners are hearty people," he said, "And, nothing lasts forever." 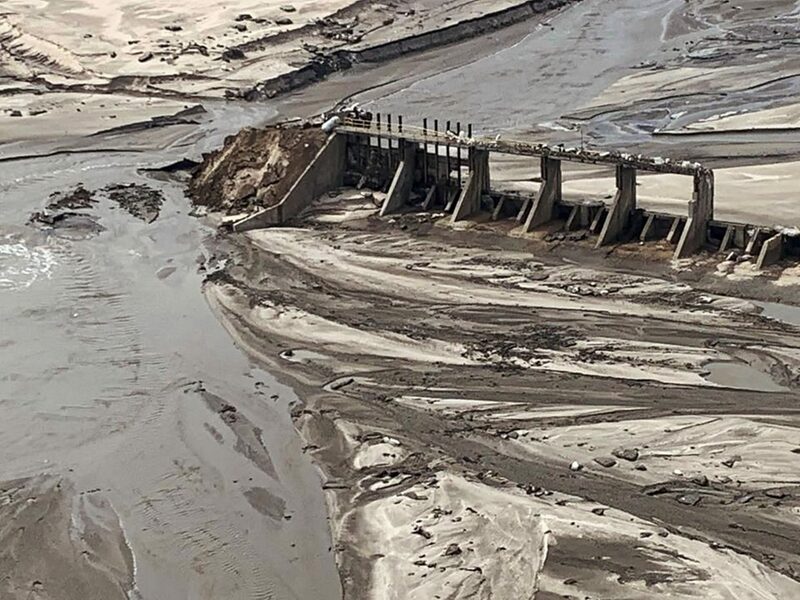 In north and northeast Nebraska, what's being described as a 'wall of water' careened down the Niobrara River and into the town of Niobrara in Knox County when a dam failed in Spencer, Neb., Friday, March 15. "We've also had a lot of overland flooding, which is tough for ranchers," said Chris Buttler, senior forecaster NWS in North Platte, Neb., "although our impacts are minimal compared to Norfolk and Fremont." A brief period of several dry days are forecast mid-week (March 20-22) for flooded areas. "However, beginning Friday, there's a fairly high chance of rain for the southern half of Nebraska, as a relatively strong upper level trough (of low pressure) will move from the four corners up into Montana, and bring probably all rain for us here," Buttler said. In the small community of Dannebrog, Neb., just north of Grand Island in central Nebraska, flooding has ruined the building structure of Our Saviour's Lutheran Church, which was condemned Sunday, March 17, after its walls started bowing. Pastor Sheri Lodel said a nearby creek near the Platte River flooded Dannebrog, one mile inland from the river. "We've having to gut out the church basement because of mold and mildew that's starting to form. The whole town is just a mess. 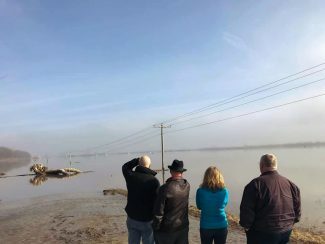 The farmers I've been talking to say so much sand and soot has gone into the field, and they don't know if they can get grass to grow," Lodel said. She said many folks have been providing food in the community and surrounding areas. "Now, ranchers are grieving over cattle lost. One rancher said they lost seven calves, another lost three and he had a small herd." Regarding the church, an engineer will inspect the remains to see what may be done. Church members may use the fire hall as a temporary building, for now. "People are just fantastic pulling together — doesn't matter what financial status or denomination — they're coming together and doing anything they can," Lodel said. To contact Lodel, due to the volume of calls, email is best: ckrofsophia@hotmail.com. Nebraska's capital city of Lincoln has water restrictions. Sunday evening, Lincoln Mayor Chris Beutler issued mandatory water restrictions, and is encouraging Lincoln citizens to do everything possible to reduce water usage until further notice, due to flooding. Beutler stressed that Lincoln's drinking water is safe. Restrictions include: minimizing flushing toilets, postponing bathing and doing any laundry and dishwashing as long as possible and using disposable table settings. The NWS issued numerous flood warnings for Nebraska areas in mid-March. A Flood warning means that flooding is imminent or occurring. Some locations in east central Nebraska that will experience flooding include: Omaha, where the Missouri River at Omaha at 10:15 a.m. Sunday had a stage of 34.3 feet, or 5.3 feet above flood stage (flood stage is 29 feet). Moderate flooding is occurring and moderate flooding is forecast. The river will continue to fall to below flood stage by late Friday morning, March 22. Other cities and towns warned about flooding: Lincoln, Columbus, Beatrice, Falls City, Council Bluffs, Bellevue, Fremont, Papillion, La Vista, Blair, Nebraska City, Seward, Crete, Plattsmouth, Schuyler, Ralston, Glenwood, Shenandoah and Wahoo. In southeast Nebraska as of 8:47 a.m. Sunday, March 17, NWS reported residual extensive flooding, as rivers and streams continued to be at record levels. Travel was hazardous, and discouraged. People are advised not to drive across flooded roadways. 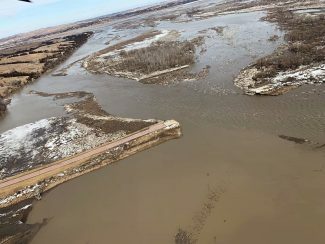 In north-central Nebraska as of Sunday afternoon, the Nebraska Department of Transportation reported (to the NWS) numerous roads were closed or impassable across portions of central and north central Nebraska due to flooding. Also, portions of the Elkhorn River were above minor flood stage, including near Atkinson, O`Neill and Ewing in Holt County. Other locations dealing with flooding concerns include O`Neill, Ainsworth, Bassett, Spencer, Springview, Atkinson, Stuart, Ewing, Butte, Long Pine, Lynch, Page, Newport, Naper, Johnstown, Gross, Norden, Inman and Bristow. 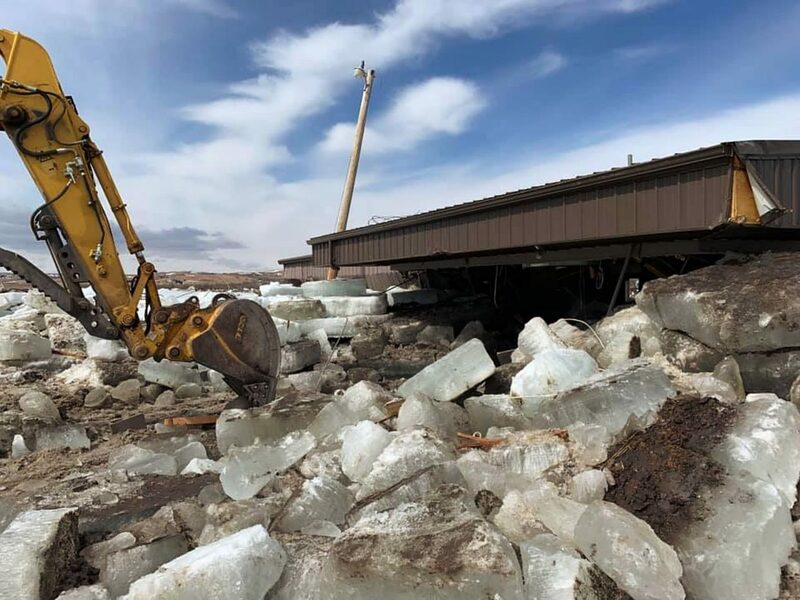 In central Nebraska, on Sunday, March 17, Emergency Management reported some roads and low lying areas were closed or impassable across portions of north central and eastern Custer County, Nebraska, due to flooding and snowmelt. Anselmo, Broken Bow, Buckeye, Sargent, Westcott, and nearby areas including Victoria Springs State Recreation Area were advised that additional runoff into Monday could worsen flooding. The National Weather Service has issued it's 2019 Spring Flood Outlook for eastern Nebraska and western Iowa, and unfortunately, for much of that area, there is a much-above-normal risk for minor and moderate flooding this spring. Also there is an increased threat for major flooding, largely the result of high soil moisture, elevated river levels and an increasing snowpack. Severity of flooding depends on the location and intensity of spring rains and thunderstorms.